Sautee the onions, garlic, pepper and cumin in oil. Salt and pepper to taste, cook for 5 minutes. Add the chicken and seal it in a saucepan on both sides. Add the wine and cook until the liquid begins to disappear. Add the raisins, the chicken broth and tomato sauce. Cook for 15 more minutes then add the oregano and olives. Continue cooking over medium heat and stir occasionally for 5 more minutes. You can use the leftovers for empanadas or chicken pastelitos. Picadillo is a typical Cuban dish prepared with ground beef, onion, garlic, cumin, wine, tomato sauce, raisins, olives and served with white rice. 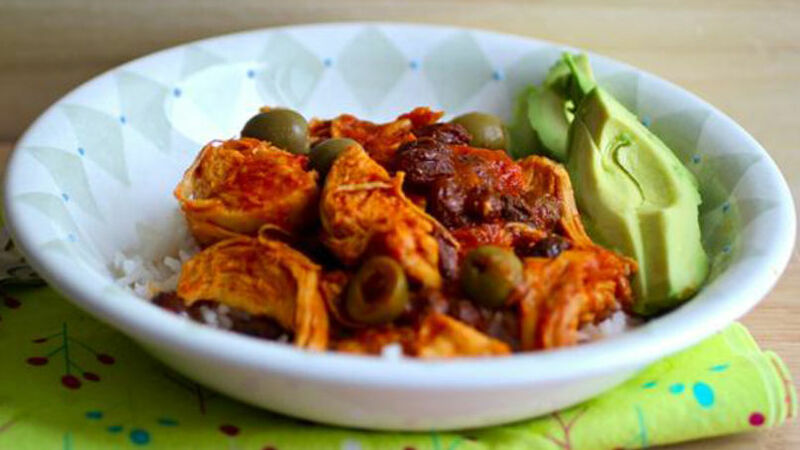 Today I want to share a delicious variation of this traditional recipe made with chicken. This recipe is really easy to prepare and you can leave it ready the day before so that when you get home the next day all you have to do is heat it up. Everyone in my house loves this dish; even my husband who isn’t a fan of raisins likes it! This recipe is filled with sazón and color. It goes very well with a glass of wine.